It is good to get out of your comfort zone on occasion. My happy place is with 0.4 mm gel ink pens, and when I wander too far to the left or right of that midpoint in my spectrum I increase the chance of being disappointed. So when I say that the Schneider Slider Memo XB 1.4 mm ballpoint is out of my wheelhouse you can see just how far out it really is. I mention all of this because I often don’t give pens similar to the Memo XB a fair shake. Good pens come in all shapes and sizes and this is a very good pen. I have always been impressed with Schneider’s ballpoint ink and this one continues the trend. It is smooth, dark, skip free, and for a tip this wide, surprisingly clean. The barrel design is equally as nice. I’m not sure who actually came up with the design first between Schneider and Stabilo (there have some awfully similar designs) but the Memo XB is well done. The slick plastic surrounded by a rubber coating gives it a great feel in the hand. I picked this up at Office Depot for $3 a couple of months ago and I’m glad I did. While it won’t land on my Top 5 list anytime soon, it is a nice option to have. What pen out of your comfort zone have you tried and liked? 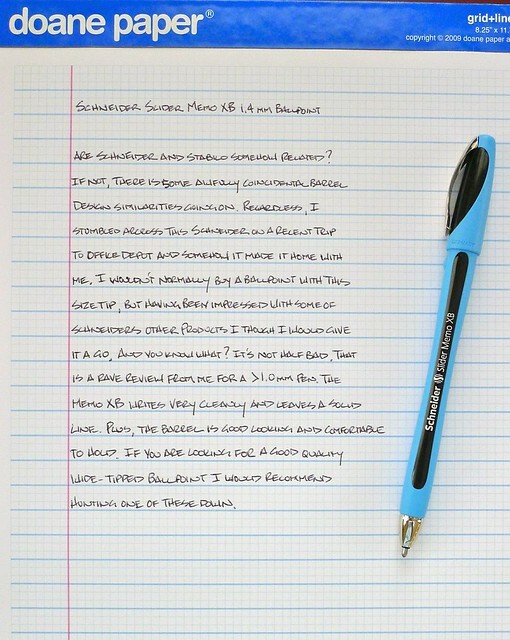 Posted on July 6, 2012 by Brad Dowdy and filed under Ballpoint, Pen Reviews, Schneider.